Using radio-frequency technology, the SmartDoor™ reads the unique signal of a SmartKey™ worn on your pet's collar and triggers the battery power-driven flap to unlock. 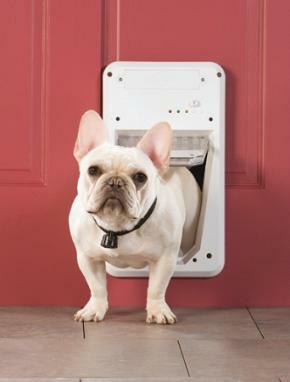 When the SmartDoor™ no longer senses your pet's SmartKey™, the flap automatically locks back into place. The SmartDoor™ can detect up to five programmed SmartKeys™ and also operates in two other modes: fully locked mode and unlocked mode. Locked mode does not allow entry or exit for any pet and unlocked mode allows entry and exit for all pets.